Vivian Tsang is a second year student in the Faculty of Science. 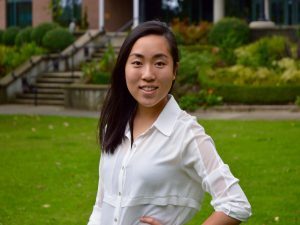 Over this past year at UBC, Vivian has invested her time in multiple facets of campus life. She sits on the Science Undergraduate Society as a General Officer, conducts research in partnership with the Prostate Care Centre and recently spearheaded an AMS Club titled the Humanitarian Organization for Providing Empowerment. Throughout her next few years, Vivian hopes to pursue a career in the healthcare field and to continue inspiring young people to realize their dreams. SI of Vancouver played a big role in her life after graduation and Vivian wants to inspire other girls to pursue their personal passions as well. Increase access to formal and non-formal learning opportunities. Improve access to economic empowerment and sustainable opportunities for the employment of women. Eliminate violence against women and girls and ensure women's participation in conflict resolution. Ensure women and girls have food security and access to the highest attainable standard of health care. Address the specific needs of women and girls by improving environmental sustainability, and mitigating effects of climate change and disasters.